Experimental models of visual ability against different environment scenarios, from deep in water to being in air during daylight, give an estimation of the efficiency of vision in each case. The researchers computed the range, volume and viewing factors across a range of conditions and pupil sizes. The results showed that fishes underwent a series of visionary improvements in stages moving from water to land. The first step was when they began to look upwards towards light. Ambush predators, which surprise their prey by a rapid attack coming up from underneath, do this. A Devonian fish called Panderichthys had a head shaped perfectly for this type of attack. Its vision was best adapted for scanning across the plane of view when looking up for prey. The second stage was when fishes took to surfacing and poking their eyes above water to peer through the air at the environment around them. Fishes such as Tiktaalik, the fish most closely related to tetrapods, exemplify this stage very well. It has a long crocodile like head with similarly placed eyes in the centre, raised up so they can look around. It was found that after the emergence of vision, from the fully aquatic vision to totally aerial vision, there was a five million fold increase in the total amount of space monitored by vision. Even looking from the water's edge, by poking their eyes above the water, fishes such as Tiktaalik had a massive increase in visual ability to spot prey, such as large worms or bugs on the nearby river bank. The simulations showed that the bulk of the eye size increase occurred before tetrapods were on land, while my own earlier prediction was that the increase would occur after they were on land. That's because I'd only envisaged seeing through air happening at the same time as terrestriality. 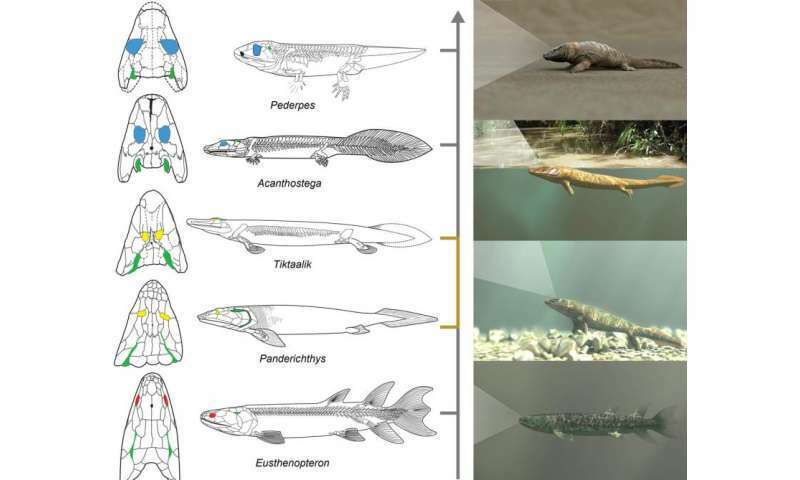 So it was a big relief when I subsequently came across Long and Gordon's 2004 paper that synthesized several anatomical changes and gave the idea that early tetrapods, still largely fully aquatic, may have hunted like crocodiles – living in water but hunting by seeing through air. The new research suggests that this Buena Vista view was perhaps the zip-line effect for fishes to take more active forays onto land. This would have accelerated the development of more robust limbs and the emergence of well-developed digits to replace fin rays. Some of these advanced fishes, such as Panderichthys, already had digits present inside their fins. Fully formed rows of fingers and toes would be clearly more advantageous for moving on land, though some of the first tetrapods had evolved digits whilst living in water. The big implication of this research is the effect it all had on our brains with the shift in behaviour and cognition that accompanied this transition onto land. With larger eyes, vertebrates began long range sensing for the first time. To sneak up on prey successfully implies they must have been planning an ambush attack, such as creeping up from behind. Otherwise the prey would see them coming and escape if they approached directly. In living fishes and amphibians the time between prey detection and escape is reduced by about 6 microseconds through using a single large cell called a Mauthner neuron cell to initiate the escape plan. This neural circuity enables ultra-fast reactions to stimuli. These Mauthner command cells are today only found in fishes and amphibians. Later, more efficient nerves in the spine displaced the need for Mauthner cells. It seems that the origin of long range vision started with a common ancestor of fishes and tetrapods, most likely one of the highly advanced lobe-finned fishes such as Tiktaalik. So be thankful for our fishy ancestors that boldly ventured to go where no fish had gone before, out of the water up on to land. Without the long range vision that accompanied this event our ability to plan and perform complex actions might never have evolved.